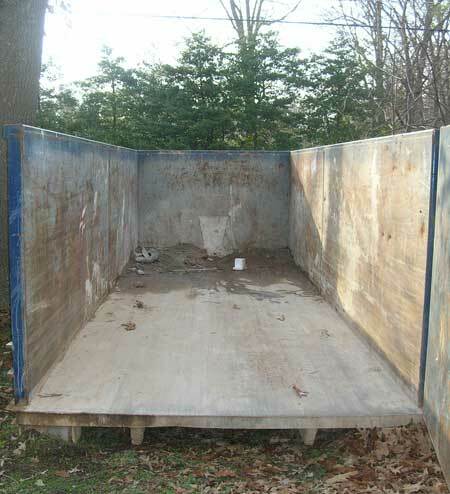 Friday afternoon, a soft-spoken fellah in a beatup truck delivered a dumpster. 39 yards of empty. When asked if he could place the rolloff on the asphalt of the drive, between the oak tree and Scott's fence, he said, "Yep, I can do that." He backed up the truck, clanged the iron box down on target, then said, "I'll be back Tuesday to pick 'er up." He drove on to the next part of his life, a simple guy doing a simple job. The dumpster was almost empty. I unhooked its heavy safety pins, pulled hard on the iron handle, and its door rustily opened. I found a rubber wheel and a small styrofoam box in a far corner on its dirty floor. Fair enough. The rest of the space was mine to fill. There was a basement of stuff waiting, 3/4 of it not my own. Abandoned here by human beings who meant something to me but who have naturally gone on, due to death, growing up, figuring it out, feeling better, discovering new places. Our lives have layers, and the basement was one that required a final purge. So, like a sculptor who cuts away stone until the picture appears, I began emptying the full to fill the empty. I found a old computer printer that boasted, under the dust of its label, "24 scalable fonts", two long-in-the-tooth microwaves, eight sets of tall bookcase bones sans shelves. Empty cardboard boxes for TVs no longer telecasting from here. Much furniture from kids' college days, schlepped from far-off places like Arizona and Lake Anna, now too musty and broken to be donated anywhere but the garbage. And let's not forget the boxes of old tax records Uncle Sam no longer considers important. And then I found the letters. Pre-Internet, a box of messages written in pen, on some sort of paper. Postcards and verses from poet Landry, greetings from Bahstin K, a summer full of letters from Hank, now nursing the ill out in California. And I discovered some of the missives my parents wrote each other during the six years of their courtship in the 40s. Delivered by mail across the river from NYC to NJ, then back again. These letters, in this basement, were tied in fancy ribbon, now faded. My parents battled for as long as I can remember. They were passionate about each another, and both loved to dwell in conflict, melodrama witnessed and understood in my childhood as a way of showing off, not the way to treat an important relationship. In another box, under some file folders, I found an inter-office memo envelope, the kind with two cardboard discs and a string for fastening, fat with letters I wrote my late husband Ken throughout our relationship. The times I was on the road teaching, so far away in the effort to support us through his illness; some composed as he lay in the next room, sleeping. I had no idea he kept them. No ribbons tie them together, then or now. Just a plain honest envelope, one of string and soul. Sitting in a clearing on the cold basement floor with those different messages in my lap, I was reminded how letters are, as Thornton Wilder called them, "news of the soul." How if you read between the lines, carefully, you receive the essence of the person, who they are, what they are trying to share. How some humans can only express, without the audio armor of humor and intellect, how much they really feel through their plain penned words. So the letters are now archived in a new place. A blue Rubbermaid tub, its lid burped to keep moist air away. Outside the wind is blowing, in the darkness, as I write this. The dumpster is almost full, with more to contribute to its depths later today. Another half-day effort towards the peace of finishing. I knew this would be a good finish when I read, "So, like a sculptor who cuts away stone until the picture appears, I began emptying the full to fill the empty" - I was not disappointed!